Sir Williem Le Scrope, K.G. Legend: Sig [illun: Will(elmi: L)escropp: d(omini :) Manne: at: insularu[m]. In 1475 a controversy arose between Lord John Scrope, a descendant of Sir William Scrope, and Lord Thomas Stanley (then Lord of Man), as to which of them had the right to bear the arms of Man. The King (Edward IV) in 1476 issued the following order:-'Rex omnibus ad quos, etc. Salutem, Sciatis quod inspiximus literas nostras subsigno nostro Manuali signatas et per Milites Garterae nostrae inspectas, factas in haec verba.' Edward by the Grace of God King of England and of France, Lord of Ireland, remembryng the pretence and claime of John, Lord Scrop shewed unto us for the bering of the Armes of the Eile of Man, which now owre trustie and right wel beloved Thomas E. Staneley Stuard of owre Householde berith, for brevenes of Tyme, havyng no convenyant Season to know the determination of the same, And provydying that novariaunce therefore be hedde nowe in owre Voiage, have wolled and desyred that for the tymes and Seasons that the said Lordes shall continue in our Service in oure Realme of Fraunce, Duchie of Normandie and elsewhere byyonde the See, and also unto oure and their retournying next to this oure Realme of England, or either of theym, that the said Lord Scrop shall abstain and forbere the use and wering of the said Armes of th' Eile of Man, whereunto for the seid desire he is agrede - alwey forseyn, that the said Wille, desire, abstinence, and forberying be not prejudicial! nor damage in that behave unto the seid Lord Scrop, ne to his Heyres, nor be of non effect, Strength nor vertue but for the tyme above Expressed, Et hoc omnibus, quomm interest, in hac parse, incotesimus per presentes, In Cujus etc. teste Rege apud Westmon' primo die Maij.' It does not appear that this claim was renewed by Lord John Scrop after the King's return from France. William le Scrope was one of the most distinguished of those whose fortunes have been, in one form or another, linked with those of Man. He belonged to a family of whom it has been aptly said that 'its history is for some time the history of Yorkshire, indeed of the North of England.' Burke refers to the family as follows: 'In the period of three hundred years the house of Scrope produced two Earls and twenty Barons, one Chancellor, four Treasurers, and two Chief Justices of England, one Archbishop and two Bishops, five Knights of the Garter, and numerous Bannerets the highest military order in the days of chivalry. The exact date of his birth is not known, but it was probably about 1351. He was the eldest son of Sir Richard le Scrope, of Bolton, Lord Chancellor, afterwards created Lord Scrope of Bolton. His mother was Blanche, sister of Michael de la Pole, Earl of Suffolk. As a youth he served under John of Gaunt in the Hundred Years' War, during which he was knighted for valour. Amongst many other dignities, in 1389 he was appointed Constable of the Castle of Queenborough, Governor of Beaumaris Castle, and Chamberlain of Ireland, in 1391 he was given a grant of the Castle of Bassburgh for life, and in 1394 a grant of the Castle and Town of Marlborough. In 1394 he was elected a Knight of the Garter, and was appointed Vice-Chamberlain of the Household, and in 1396 he was appointed Lord Chamberlain. In 1393 he purchased the Island from William Montacute, Earl of Salisbury. The record is as follows: Wilhelmus le Scroop emit de domino Wilhelmo Montacute Insulam Euboniae, id est Manniae, Est nempe jus ipsius Insulae, ut quisquis illius sit Dominus, Rex vocetur cui etiam fas est corona aurea coronari. (` William le Scroop bought from Sir William Montacute the Island of Euboniaw, that is Man. It is a right of this Island, that whoever is Lord of it, is called King, who also has the right to be crowned with a golden crown). Capgrave, in his Chronicles of England, records the sale in the following words:-' A.D. 1392. In this year Sir William Scrop boute the ylde of Eubony, with the crowne, of Sir William Mountagu erl of Salesbury: for he that is Lord of this yle may were a crowne. This yle stant betwixt Yngland and Yiland. The name is now. Ile of Man.' Camden, in his ' Britannia,' A.D. 1607, adds the interesting note that ' a considerable sum of money' was paid, 'according to Walsingham' (Historia Anglicani). As also Selden's ' Titles of Honour' Chap. III. A.D. 1650. In 1398 Thomas, Earl of Warwick, on his banishment to the Isle-of-Man, was entrusted to the care of Sir Wm. le Scrop and Sir Stephen his brother, to carry him safely to the said Isle and to guard his body there, their own bodies to answer for it (' peur corps illesques'),without letting him depart from the said Isle. Probably the fact of his being King of Man may have been the reason why this duty was entrusted to him. In Issue Roll, A.D. 1399 (22 Rich. II), Manx Soc., Vol. VII, p.2I4, it is recorded that he received the sum of £1074 :4s. 5d. for, inter alia, his charges and expenses in connection with the safe conduct of the Earl of Warwick to the Isle of Man, and for his support there. He was created Earl of Wiltes in 1397. In 1398 he was appointed Ambassador to treat for peace with Robert, King of Scotland, and in 1399 was made Lord Treasurer of England. The following year King Richard II. appointed him one of the three Guardians of the Realm during his (the King's) absence in Ireland. The Queen Isabel (then only eleven years of age) was placed under his care at Wallingford Castle. From thence he retired to Bristol Castle, where he was defeated by Henry of Bolingbroke, and beheaded without trial, in July, 1399. His head was sent in a white basket to London and placed on London Bridge. 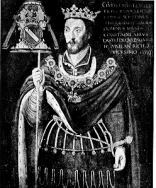 After the accession of Henry IV, it was delivered to his widow. He married Isabelle, daughter of Sir Maurice Russell, but had no issue. Shakespeare in Rich. II, 111,2, records the announcement of his death to the King. The historians of his time have little good to say of him. Walsingham, in his Historia Anglicani ii, 213, considers that the 'human race hardly contained one more infamous and cruel.' He was also charged with farming the royal escheats, and Shakespeare, Rich. II, 111, i, puts into the mouth of Lord Roos,-'The Earl of Wiltshire hath the Realm in farm.' It should, however, be borne in mind that this Lord Roos was a supporter of Henry of Bolingbroke, and would therefore be unlikely to view the Earl's advancement with favour. In Annales Richard II, p. 157, he is referred to es 'Mires previdus et praedives.' His career, however, in France bears a sufficient testimony to his bravery and military capacity, and he appears to have served his King with unfailing loyalty. It is impossible, at this distance of time, to judge how far ihe estimates of his character were influenced by personal or party bias. As far as the Isle of Man is concerned, his short rule has left no record behind it, either for good or ill. After his death, King Henry IV granted the Island to Henry Percy, Earl of Northumberland. The portrait of Sir William le Scrope, is from the oil painting [then] at Danby Hall, Wensleydale, Yorkshire. 15 Junii Ano Rich. 2. His arms are in the opposite corner. He wears the collar of the Garter, and the gold crown as King of Man. The painter of this picture is unknown, but it is said to be of the time of Elizabeth or James I.
I am much indebted to Henry Scrope, Esq., of Danby Hall, for his kindness in enabling me to obtain reproduction of this portrait, and for his ready help in other respects.